full-fat dairy products, e.g. yoghurt, fromage frais and custard. 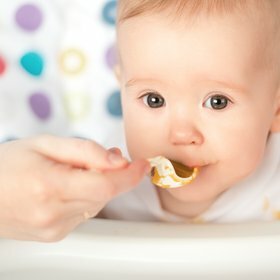 Use mashed-up food from your family meal where you can, you don’t need to make your baby a separate meal, but do not add salt or sugar to the food until you have removed their portion. If you offer them a wide range of foods that you normally eat, this will help to develop their tastes and may reduce choosiness or fussiness later on. If you do use ready-prepared baby foods as well as home made food, then make sure you check the use by dates and always ensure the seal isn’t broken or damaged, or that the jar’s been tampered with in any way. Salt – 7-12 months babies should not have more than one gram of salt per day. Breast and formula milk both contain salt, so don’t add any salt to foods for babies. Sugar – Try to avoid too many sweet biscuits and adding sugar to their food. It could lead to a sweet tooth and expecting treats after or in-between meals. Remember; they have no preconceptions about dessert after a meal and so will not expect to follow a savoury meal with something sweet. Try fruits or breast/formula milk to sweeten foods instead. Honey – The Food Standards Agency (FSA) recommends that honey should not be given to a child until they are 12 months old, as it can occasionally contain bacteria which can produce toxins in your baby’s intestines, causing a very serious illness – infant botulism. Once your baby is a year old, their intestines are developed enough for the bacteria not to grow. It is also a form of sugar, and so should be treated in the same way. Nuts – should not be given to children under five years old, because of the risk of choking. But butters and ground nuts are ok for children over six months old, as long as there is no family history of allergy present. Fish or shellfish – The FSA recommend that these are avoided in children under six months old, due to the small possibility of an allergic reaction. Eggs – cooked eggs should not be given to your baby until they are at least six months old. Ensure that they are thoroughly cooked, and the egg yolk and white should be firm. Avoid giving your child foods which contain raw egg, such as mousse or home-made mayonnaise. Cow’s milk – avoid giving this as a drink until your baby is 12 months old, because it’s too low in iron and other nutrients. From the age of six months you can use a small amount of it in cooking (e.g. custard). When you do introduce cow’s milk to your baby’s diet, ensure it is full-fat. Low-fat foods – are not suitable for babies under the age of two – fat is an important source of calories and some vitamins.